Listed below is Zap-Map’s top 10 electric vehicles that are available in the UK. To find more information on the vehicles mentioned in our “Top 10 EVs”, or to see a full list of EVs on sale in the UK, visit our Available Models Page. Building on the success of the first generation Nissan LEAF launched in 2011 which set the standard for battery electric family cars, the 2013 model is refined and improved, raising the bar a second time. With over 100 updates, the official driving range is increased to 123 miles and the recharge time can be halved. Nissan offer the LEAF in four different trims and charging options – Visia, Visia+ Acenta and Tekna – the newest model and/or battery being available through outright purchase or lease to suit buyers of all persuasions. The Nissan LEAF is the most popular electric vehicle in the UK and recorded it’s best ever sales period in September 2014. It is as if the BMW i3 electric is modelled more on a smart phone than a car with a level of connectivity never before seen in a production car. It is also unique in being made from carbon fibre /reinforced plastic and produced from a highly sustainable production cycle. Designed from the outset as a premium urban vehicle, the i3 packs a punch with 170 bhp, accelerating to 62 mph in under 8 seconds. In addition, it has a top speed of 93 mph and a driving range of 80-100 miles. The i3 delivers an all-electric and fully ‘connected’ driving experience, with the quality and style of any BMW machine. What’s more, is that the i3 is one of the first cars to offer a inlet compatible with CCS charging connectors, allowing both AC and DC rapid charging. 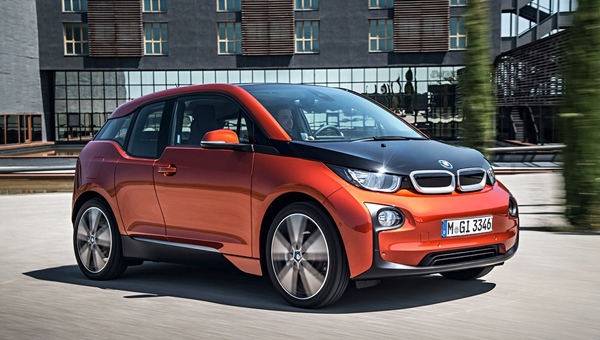 With its efficient design, impressive range and zero emissions the BMW i3 won the 2014 ‘World Green Car of the Year Award’. On the road prices start at £25,680 (including the £5,000 Government Plug-in Car Grant). The Renault ZOE Z.E. supermini is the most popular of the Renault electric range. Its 60 kW (80 hp) electric motor gives an impressive acceleration of 0-60 mph in just 8.1 seconds and a top speed of 84 mph. While a single charge provides a driving range of up to 130 miles. Like others in the Z.E. range, the ZOE is priced at close to ‘normal’ prices, with the battery being leased to reduce upfront costs; from £13,650 (including Plug-in Car Grant) plus £70 monthly for battery lease. The Volkswagen e-Up! is the battery electric version of the popular VW Up! city car. With excellent energy efficiency and a ride to match the e-Up is near faultless, if it weren’t for it being a little pricey (£19,270 OTR including grant). It can accelerate from 0-60mph in 12.4 seconds and has top speed of 80 mph. It is fitted with charging inlet that takes a CCS connector and therefore is one of the few cars capable of both AC and DC rapid charging. The e-Up! also offers an impressive range of 100 miles. Not only does it have a decent range (260 to 320 miles) depending how hard you drive it, the Model S is faster than some AMG Mercedes models that would achieve 10 mpg on fossil fuels. The Model S on the other hand emits zero tailpipe emissions virtue of it being a battery electric EV. With Tesla’s supercharger network owners of the Model S now have free access to charging points across the UK that pump out 120kW, enough to facilitate an 80% charge in 20 minutes. The car has been a huge success internationally and among many accolades it was named the ‘World Green Car of the Year’ for 2013. For business users the Model S makes massive sense especially under current taxation policies. Following the quiet success of the Ray EV in Korea, Kia launched the Soul EV in the UK late on in 2014. Based on the same platform as the Kia Cee’d, the new model is wider and longer than the first-gen Soul (to accommodate a battery pack), as well as a 29% stiffer body shell and revised suspension geometry. Capable of both standard and rapid DC charging (in less than 1 hour), the Soul EV is priced at £24,995, including the OLEV grant. The e-Golf is the battery electric version of the top selling VW Golf. It offers a healthy range of up to 118 miles which is just shy of what the Nissan LEAF can offer. What the e-Golf has on its side, however, is performance. It has a ‘sporty’ feel which is not fully reflected by the cars stats; a modest 0-60 of 10.4secs and top speed of 87mph. The car possesses the ability to be fully charged in under 30 minutes from a Rapid charge point and as with all battery electrics has zero tailpipe emissions. The cars OTR price is £25,845 (including the grant). The e-Golf to be followed by an exciting plug-in hybrid version called the Golf GTE which VW has promised for 2015. The A3 e-tron is Audi’s first plug-in hybrid model, with a four-cylinder turbo 1.4 petrol engine in parallel with a 75 kW electric motor. The resulting 203 bhp enables the e-tron to accelerate from 0 to 62 mph in 7.6 seconds with a top speed of 138 mph. More frugally, the A3 can travel up to 30 miles in electric-only mode at speeds of up to 80 mph, and the official combined fuel economy is 188 mpg. Audi have opened their order books with deliveries expected to be made early 2015. The Outlander PHEV is the only hybrid on the market not to carry a price premium for its hybrid technology. For this reason, it is able to put its entry level GX3h model out for the highly competitive price of £28,249 (including the Governments Plug-in Car Grant). This is the same price as the GX3 diesel version. It qualifies for the grant with an average 44g/km of CO2 emitted through its tailpipe with the option of a pure electric mode that offers a 32 mile range and zero emissions. The Outlander PHEV is leading the pack of plug-in SUVs and crossovers that seem to becoming increasingly popular for their uncompromising combination of fuel economy, size and performance. A great option for fleet owners and businesses the Kangoo ZE is a serious contender in the van market. With price tag of just £15,495 (including OLEV grant) it provides a 100 mile range off a single charge and has an equivalent MPG of 196, that’s over double what conventional vans can offer in fuel economy. As a battery electric van it also has the added benefit of having zero tailpipe emissions, which qualifies the Kangoo ZE for a number of subsidies including a reduced company car tax rate.